Montana Fish, Wildlife and Parks is currently soliciting public comments on Bison conservation and management, in what is the latest step in a protracted yet inexorable step towards reintroducing Bison into more parts of the Montana landscape. The debate promises to be a fierce one, for reasons I’ll summarize below, and the cultural stakes are very high indeed. For that reason I’d strongly encourage readers to peruse the plan and submit their comments. 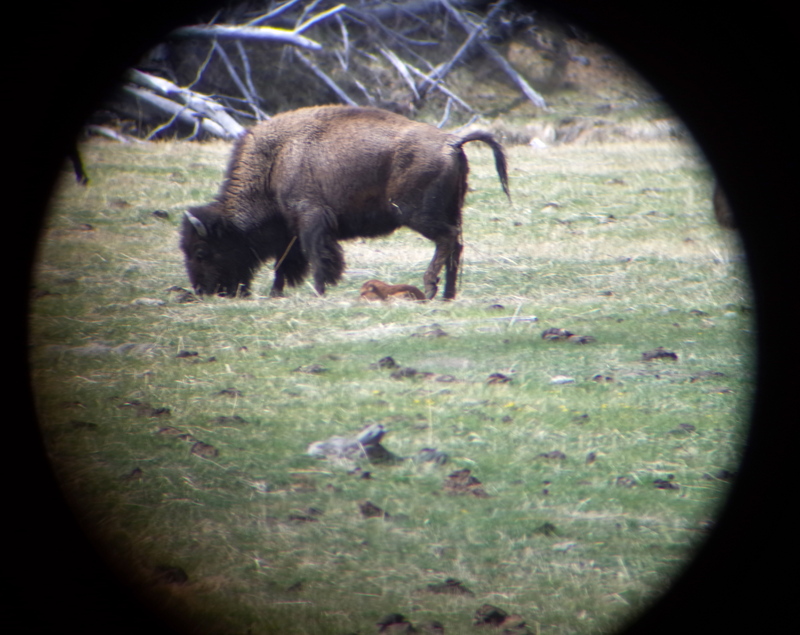 Newborn bison calf, Yellowstone NP. There are quite a few Plains Bison in the US, the vast majority of which are not really wildlife. However noble in spirit, and however high and burly the fence, bison bred and raised in captivity for the purpose of meat or breeding are livestock. There might be as many as a quarter million such bison in the US today, many of them containing at least a bit of cow genes. The number of truly wild herds has remained quite small for the past half-century. Many of these have colorful histories. The House Rock herd in Northern Arizona was introduced to the high desert east of the Kaibab Plateau in the 1920s, and they happily stayed amongst the pinons and junipers until the last fifteen years, when most of the herd migrated full time up on to the Kaibab, where they spend the whole year living between 7 and 9 thousand feet. Arizona has a goal of a consistent population of 200 bison. The Henry Mountains herd in south-central Utah has a similar history. They were introduced into the desert east of the Dirty Devil River in the 1940s, a harsh area with little browse or water. The soon crossed the river and moved west, using the slopes of the Henrys as summer range, and the Burr Desert around the head of North Wash as winter range. In the early 60s brucellosis was detected and whole herd of 71 animals captured (one assumes via helicopter, among other things) and inoculated. Reportedly this experience increased the herds wariness, and caused them to move into the mountains full time. The herd now numbers around 300, and is one of the more coveted and hard to get hunts in the US, with the bison renowned for being difficult to locate and stalk. The various bull and cow hunts each fall routinely do not have 100% success rates, a noteworthy thing for a once in a lifetime hunt (Utah will not allow you to draw the tag twice) for a 1000+ pound animal which is not difficult to see from a distance. These two examples are worth contrasting with the third major wild herd in the US, the one in Yellowstone National Park. Yellowstone maintains a population of between 3000 and 5000 bison year to year. The Kaibab and Henry herds are both limited by terrain, it’s difficult to see either expanding in size or range due to natural restraints (read: surrounded by desert). Historically the modest Yellowstone bison population was contiguous with the massive bison population which roamed the American plains. Yellowstone gets a lot of snow in the winter, and as a result contains lush summer range and limited winter range. It is reasonable to suppose that historically the majority of the bison who summered in the park migrated north or south to lower elevations come autumn. Today concerns over brucellosis transmission and property (aka fence) destruction artificially constrict the bison’s winter range, and thus the size of the Yellowstone bison herd. According to the Buffalo Field Campaign (granted, not the most scientific of sources) over 8500 bison have been killed by the state of Montana in the past thirty years, with the yearly total varying massively (from zero to over 1500) depending on the size of the herd and the severity of the winter within the park. This well encapsulates the obstacles facing bison reintroduction to more wild places in Montana. The brucellosis concern is mostly, but not entirely, specious. Elk carry the disease, but tend to not calve in the same places cattle graze, and are thus less likely to pass it along. Brucellosis inoculation has been quite effective, and the presumption that any transplanted bison would go through quarantine removes this as a valid concern. Fence stomping and the migratory, independent nature of bison is a very valid concern, especially when contemplating the most ideal alternative (#4): “Restoration on a Large Landscape Where there are Minimal Conflicts with Livestock.” Quite simply, I can’t imagine many areas in Montana where that might take place. Allowing the Yellowstone bison to permanently populate the areas around West Yellowstone, Gardiner, and along the upper Gallatin River is one thing. What to do when they attempt to move further to the Madison River valley, greater Bozeman area, and Paradise Valley is another thing. As has happened with the Henrys, perhaps hunting pressure might keep them contained in these areas, but that seems unlikely, or at least far more complicated. The larger question is whether larger plains areas, such as the CM Russell Wildlife Refuge, could be repopulated with bison, and if they could be contained in a sustainable way which would allow them to function as close to a wild herd as possible. FWP does not address that question, yet. At this stage they’re just looking for public feedback. I let them know I’m interested in more detailed proposals for alternative four, and I suggest you do the same.